It is hard to imagine breakfasts, social gatherings, business meetings, negotiations for carpets in the Grand Bazaar, or ferry rides across the Bosphorus in Turkey without the presence of tea. With tea servers in streets, shopping malls, and parks shouting, “ÇAY!” (chai) the beverage is always within shouting distance. It is fundamental to Turkish social life and plays a large role in Turkey’s domestic economy. Turkey’s serious attempts at cultivating tea began in 1917 in the Eastern Black Sea town of Rize. However, due the Turkish War for Independence, it was difficult for the Government-appointed agricultural engineers to gain the residents’ support, which was critical to the endeavor’s success. In 1924 the Government passed a law stating that tea, oranges, and filberts would be raised in Rize. However, it was not until the mid- to late-1930s that the Government placed a strong emphasis on cultivating tea. The first large scale cultivation occurred in 1937 when 20 tons of seeds were brought from Batum in the Georgian Republic, and planted at the central green house in Rize, yielding 30 kilos of tea. Tea cultivation began to spread and become an inextricable part of economic life along the Eastern Black Sea Coast, so much so that towns began to change their names to have the word “Çay” in them: the town of Mapavri became Çayeli and Kadahor became Çaykara. By 1965, the production of tea had satisfied the domestic market and Turkey began to export its tea. Çay-Kur, the Directorate of Tea Establishments was founded in 1971 to coordinate both the cultivation and processing of tea, and in 1973 it went into active operation. Çay-Kur aimed to expand tea cultivation, stay abreast of innovations in tea processing technology, and import and export tea as necessary. Çay-Kur enjoyed a monopoly over Turkish tea until 1984, when tea processing and packaging were opened to private enterprise. Today, Cay-Kur still commands 60% of the domestic sales of tea. Turkey is the world’s sixth largest producer of tea, trailing India, China, Kenya, Sri Lanka, and Indonesia. Along Turkey’s Eastern Black Sea Coast tea bushes stretch from the border with the Georgian Republic to the town of Rize, Turkey’s ‘tea capital’, and extend farther westward toward Trabzon. Over 200,000 families are involved in the cultivation of tea either as owners of tea “plantations”, sharecroppers, or employees in the nearly 300 tea producing factories. All tea is produced from the same plant, Camellia Sinensis; it is the amount of fermentation that determines whether the tea turns out to be black, oolong (semi-fermented) or green (unfermented). 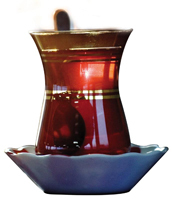 A unique feature of Turkish tea is that no chemical substances or additives are used in the production process.